Communicable disease has always followed armies, where its spread has been encouraged by living communally in close quarters in dubious hygiene. We understand today more properly the relationship between physical hygiene and the spread of viruses and bacteria; and largely that understanding began to take root with the medical advances of the mid-nineteenth century. It is not ironic that this was expedited through the military conflicts of the time. Four times as many British soldiers died as a result of illness than died in battle during the Crimean War. Figures from the American Civil War cite 224,000 deaths by disease and accident for the two million who served in that conflict. Each of these wars has its history of diligent health care professionals who championed the cause of sanitation. The popular notion of men on the Western Front being subject to terribly unsanitary conditions belie the fact that the First World War is the first major conflict in which more service personnel were killed in action than by disease. Improvement in medicine and enforced hygiene discipline in the trenches are one half of the reasoning behind this. The other has to do with a similar advance in the technological methods of war which, coolly speaking, made inflicting casualties more efficient. For the British Empire, found in the “Casualties and Medical Statistics” volume of the Official History of the War, of 876,084 total deaths in First World War, some 113,173 were the result of “Disease or Injury”, a ratio of one-third that of death in combat. Even then, the numbers for disease fatalities are eclipsed by both “Died of Wounds” (167,172) and, poignantly for the war, “Missing, Presumed Dead” (161,046). disease. Prevention can only do so much against an extreme situation. Fortunately, with considerations in regards to both discipline and morale, the military system was capable enough to administer to health concerns. From the timely removal of the dead for burial, a properly effective casualty clearing system, staunch rules for the construction and maintenance of trench latrines to a daily routine of policing up rubbish and wastage. Life at the front was as healthy as could be under the duress of being the leading edge of battle. The statistics listed above do not accurately encompass illness which did not become terminal. While sanitation at the front was better than supposed, the trenches were hardly pristine and our modern knowledge of how psychological stress affects the immune system suggests that many hundreds of thousands of men suffered illness not quite serious enough to be excused from the line, or were stalwart enough to continue their duty when they should have sought treatment. Based upon the nature of moral and legal repercussions it can also be supposed that many more were suffering from venereal disease than reported. Even then, the records indicate 153,531 admissions for VD on the Western Front alone, accounting on average from year to year 24 cases per 1,000 men in theatre. The rate of disease in armies during First World War was often predicated by locale. For the British, by far the worst theatre was that of East Africa where unfamiliar heat and a range of tropic ailments felled thirty-one men for each soldier killed in action. Not to be overlooked is the devastating influenza pandemic which first appeared on the Western Front via Spain by mid-1918. Between October and November of that year it caused 45,000 British patient admissions at a mortality rate of six per cent. The flu began to spread perniciously at the unfortunately co-incidental advent of the Armistice. The diaspora of demobilized soldiers back to homes around the world communicated the virus to untold millions. Exact figures on how fatal the Spanish Flu was are still uncertain, though from what we do know it is one of the most disastrous plagues in modern history. Because of the incidences of disease amongst soldiers, medical improvements which occurred as a result of necessity in the war do not solely reflect treatment of combat wounds. They also inspired practices in treatment and, more importantly, prevention of spreadable diseases. Despite the horror and loss of the years 1914-18, one of the positive results was a general increase in standard of health which prepared the way for many national systems of public healthcare. You may also be interested in Christopher’s piece on his own blog about the treatment of battle casualties: “The Blighty”. 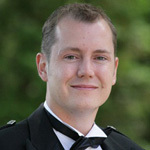 Christopher served five years as an NCO with the 48th Highlanders of Canada, commanding a rifle section, and studied History at the University of Windsor. His own family history is deeply rooted in all three branches of the British military. Of late, he has taken on the cause of perpetuating the education and understanding of history, particularly Canada's military heritage through his site "If Ye Break Faith" which showcases his short subject essays on the First World War to promote the project’s goal of collecting the biographies of the Canadian Expeditionary Force killed on Active Service in that war. An avid reader of military history and adventure travel, he also enjoys cooking and has been known to keep fit by running, from time to time. This entry was posted in Body and Mind and tagged 355 (Military science), 610 (Medical Sciences), 900 (History & geography), Blogs, R131-687 (Medicine - history of medicine), UH (Medical Sciences - other services). Bookmark the permalink.